Darwinists have a corral-full of rescuing devices to be utilized when observations do not fit their paradigm. One of these is convergent evolution, where different organisms independently evolved similar traits, even though there is no plausible mechanism or evidence. Some of these convergent evolution evasions are quite outlandish. There are distinct differences in critters, but since they have some aspects in common, it's "evidence" that they evolved from a common ancestor. It's disallowed to even consider the more reasonable explanation: they were designed and equipped by their Creator to diversify within genetic limits and fill ecological niches. (That's right, creationists do accept speciation.) A recent study of pythons and boas reached the stunning conclusion that, even though they diversified, they did not change into something else. Convergent evolution is the idea that the same trait, or set of traits, in completely different organisms were somehow produced through independent evolutionary processes. Now a new study shows how two different types of snakes have adapted to a diversity of environments by expressing the same traits (skin color and skull shape), but the study describes no mechanism for it. The authors simply attribute the highly repeatable process to the mysterious black box of convergent evolution. Although both constrictors, pythons and boas are two different types of snakes that evolutionists believe share a common ancestor in the mid-late Cretaceous about 63-96 million years ago during the last alleged age of the dinosaurs. 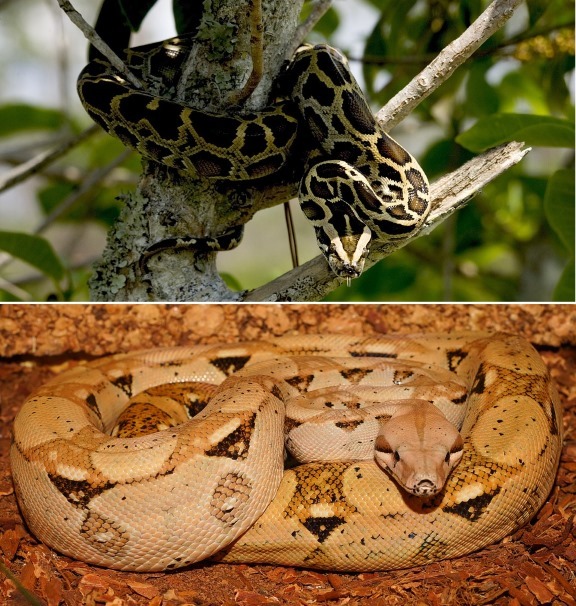 Many creationists maintain that pythons and boas are simply different created kinds. A common design explains much of the same genetic programming for some traits since the snakes' lifestyles and habits are similar. However, there are many fundamental differences between them. For example, boas bear live young while pythons lay eggs. You should be able to squeeze in a little time to read the rest of the article. Just click on "Convergent Evolution or Design-Based Adaptation?"